Say goodbye to Outliers and welcome Peak! The last few years have seen the publication of books arguing success has nothing to do with innate talent but is the results of such things as opportunity, motivation, and effort. The best-seller on the subject until now was Outliers with its well-known “10,000-Hour Rule” based on the research of the world-renowned expert Anders Ericsson. This book was a major step forward but fails miserably in the transcription of key ideas. First, there is no hard-coded 10,000-Hour Rule but the simple fact people that reach the top did it by devoting an average of 10,000 hours. Second, Outliers does not emphasize sufficiently the importance of a right sort of practice. You could try to climb a mountain, selecting whichever path looks promising and hope for the best, but you’re probably not going to get very far. Only deliberate practice guarantee that no matter how high you decide to climb, you are doing it in the most efficient. These points deserved to be explicited and who better than Anders Ericsson himself to take up the challenge. Enter Peak. Peak is the product of a collaboration with a science writer, Robert Pool. Unusual but a really great idea to make sure the insights are properly formulated and condensed. 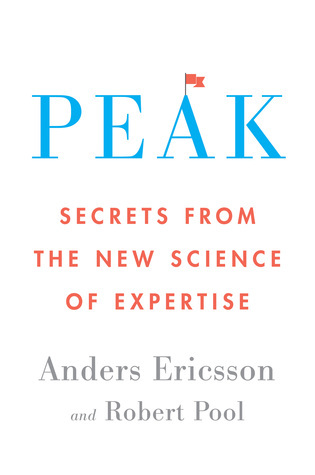 Indeed, that was not an easy task since Anders Ericsson spend more than thirty years studying the secrets of extraordinary performers (doctors, sport athletes, students, chess players,…). The book’s focus is mostly on the mental side of expert performance. The first half of this book describes what deliberate practice is, why it works, and how experts apply it to produce their extraordinary abilities. Then, follow a discussion about innate endowment and what role it might play in limiting how far some people can go in attaining expert performance. The last part explains what it means for the rest of us. One point worth to notice is that deliberate practice requires a field that is already reasonably well developed - that is, a field in which the best performers have attained a level of performance that clearly sets them apart from people who are just entering the field. This excludes many of the jobs in today’s workplace - business manager, teacher, engineer, and so on. As someone doing a job that barely exists fifty years ago (programmer), I was curious about how to apply the principles of deliberate practice. The good news is that the authors did not avoid the question and instead provide concrete elements of answer to help us get started. In the end, I have no doubt Peak will stay on the top of my “Most Influential Book” list for a long time. If it is your first exposure to the subject of expertise, I recommend you to start with Grit because Peak focused almost exclusively on the subject of deliberate practice. But you better not miss this life-changing book. Imagine a world in which 50 percent of the doctors, teachers, engineers, programmers, and so one, learn to perform at the level that only the top 5 percent manage today. What would that mean for our health care, our education system, our technology? This book is the first step towards it. Do yourself a favor and start reading Peak right now and take charge of your own potential.